In the last couple of weeks, we’ve gotten not just one, but two new synthesizers that piggy-back on the Arduino electronics platform. The result, then, is instruments that you can modify via Arduino code. The miniATMEGATRON from Soulsby Synthesizers is especially appealing. It uses the same grungy, nicely lo-fi sound engine of the Atmegatron, but it’s in kit form. It’s a pretty easy kit to put together – I watched folks assembling them in Brno earlier this summer, and they’ll be accessible to anyone with some soldering experience (or some supervision). 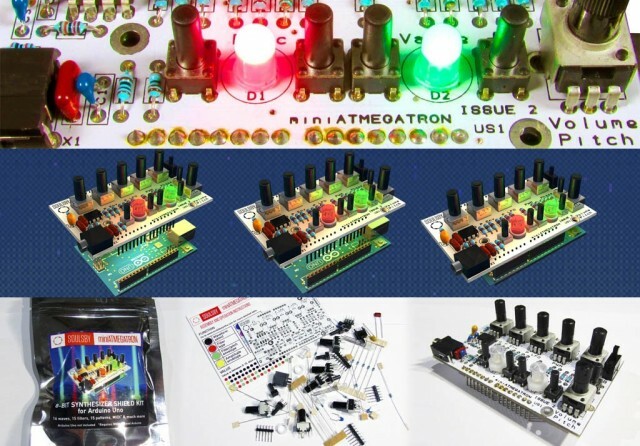 Just built as-is, the miniATMEGATRON is fun, but not terribly useful – it just plays back some sequences. 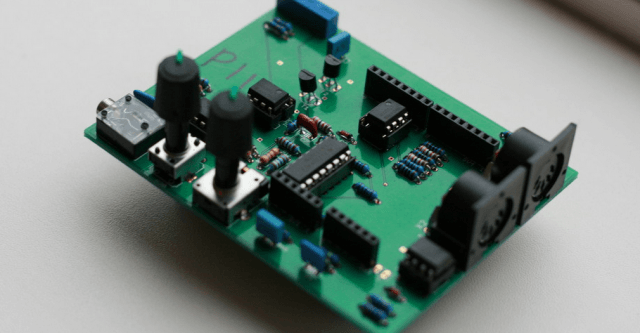 Where it gets interesting is if you either write your own code or, more likely, add the MIDI “hack.” This involves adding a MIDI port to the Arduino. Once you do that, this is a playable MIDI synth, complete with clock sync. And then there are some fun features – 16 PWM waveforms, an LFO with 16 waveforms of its own, modulation extras, and a digital filter with 15 algorithms. There’s also a “wavecrusher” and phaser and distortion effects. Basically, you get a lot of grungy digital fun in one package. The code is open source, though this isn’t strictly speaking open source hardware (only the firmware is open). If you want a ready-to-play instrument, the original Atmegatron is really your best bet, and comes in a beautiful case. It’s also still possible to modify using the friendly Arduino development environment. But the miniATMEGATRON is a steal for DIYers, and I suspect for them, the soldering and hacking will in fact be a selling point. Tasty Chips, who made the analog Sawbench before, are back with an Arduino Piggyback Synthesizer. The concept as far as Arduino is the same as Soulsby’s: you use this board as an add-on to Arduino, and then use Arduino coding to hack your own custom functions. But the Tasty Chips route is analog, like the Sawbench. You get a fully-analog oscillator, an analog VCA, and low-pass resonant filter. You can also do frequency modulation with sine or saw, controlled via mod wheel or MIDI. That’s a good thing, as otherwise I find a single oscillator setup can get a bit bland – analog or not. What Tasty Chip have done that frankly I wish Soulsby had is add MIDI right on the board. In fact, you get both in and thru built in. As with the Soulsby, MIDI functionality leans on the Arduino. It’s 59€ without the Arduino, or bundled for 79€. Both boards also rely on USB power, but with a proper adapter, you can plug into a wall socket, so these will stand on their own. That said, at these prices, both boards provide some great musical fun and some easy hackability. And both makers could provide some added stimulation with promised tutorials. I’m curious what readers think and what you do with them if you pick them up. Do let us know.